It’s always big news when celebrities change their hairstyles, and it’s always a question of who wore what best, who copied whom, and what styles stay wondrous through the ages. There were dozens of amazing, gorgeous, cute, and interesting hairstyles in 2013, but here are some of best – this is only a small peek into the wonderful world of fashion of the past year. 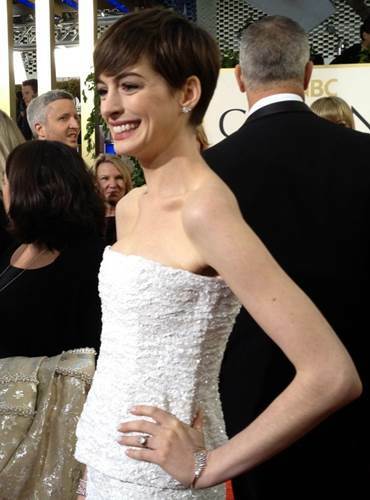 Ever since her casting in the Oscar winning film Les Miserables, Anne Hathaway has been rocking the pixie cut, and she’s been noticed for it! This cute style looks great on many, but not even Jennifer Lawrence, who cut her hair after her recent casting in The Hunger Games and Mocking Jay, can hold a candle to Anne’s style and fashion with the pixie do. Jenny only came in second place, though she still looks great with this fresh, chic hairdo. The bob is a hairstyle that doesn’t always look good in light colors, but Julianne Hough, who played Lamb in Paradise, managed to pull it off better than most. Even going against the traditional bob cut, and keeping the ends straight instead of curling up beneath the chin, this collarbone sweeping hairstyle really made her an icon in 2013. 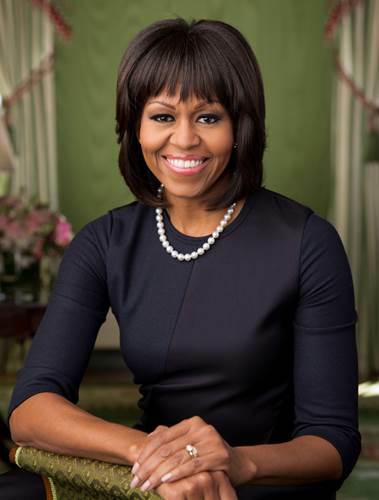 Bangs have fallen into fashion again, and Michelle Obama wasted no time hopping on board. And we’re glad she did! She wore the look of Zooey Deschanel’s full, thick bangs better than the actress herself, proving that even political figures can stay trendy, fashionable, and fabulous. Zooey Deschanel didn’t get left in the dust, though. This pop figure still came in runner up with her signature style that only Zooey is so well known for. While everyone’s going short, Jennifer Lopez kept it long. This celebrity singer reminds everyone that, even with the flood of short do’s, bobs, and pixie cuts, long hair is still as stylish as it can be beautiful. She’s worn the look on and off, but the style stays timeless, loved, and gorgeous on this famous idol. Gwyneth Paltrow, best known for her casting as Pepper Potts in Iron Man 1, 2, and 3, and in the recent Avengers film, has been known for her platinum blonde hairdo for a while now. It has yet to get old, this famous actress is working the color and wearing it beautifully. We hope she’ll keep it up, because she looks stunning with her recent uptake of a bob, but we’re excited for any changes to come in the future. Made immortal by her casting of Rachel in the long running television series Friends, Jennifer Aniston’s spun gold hair color is just as iconic as her face, and things are certainly going to stay that way. Few can wear this shining palette as well as she can, and none have worn it so wonderfully through every age. Nobody expected Emma Stone’s switch from her famous amber brown to the daring honey blonde. But when she did, bringing back the old hair color of Skeeter from her starring 2011 role in The Help, it looked better than any could’ve imagined. Always new and up to date, Emma’s truly the best at keeping things classy. Jessica Chastain may not be as iconic or well-known as many other actresses listed here, but she’s certainly working to fix that, and she’s certainly one of the very few that can wear red hair as brilliantly as she does. It even got her into a recent campaign shooting celebrities as Disney princesses. Of course, Jessica perfectly represented Merida, from Disney’s Brave. Everyone keeps up with the Kardashians, and so everyone’s going to want to model themselves after Khloe with her loved, ombre hair. Not everything has to be blond, and this beauty works dark hair with style. It’s no wonder why she’s adored, or why everyone needs to get their hands on her fashion advice. Not so much known for her face, but for her voice, Mila Kunis is still a celebrity by every name possible, casting as the voice of Meg Griffin in Family Guy, and also starring in more serious films such as Black Swan, The Book of Eli, and Tar. She’s known for her cocoa hair, and always looks fabulous. Cristina Rose is a beautician as well as the author of this article. She always loves to keep pace with the latest styles and likes to explore http://zucci.com.au/ – hair stylists Melbourne.